U.S. Releases Procedures For Approving Strikes Against Terror Suspects : The Two-Way The document provides a window into the decision-making process for authorizing drone strikes and other forms of lethal force. 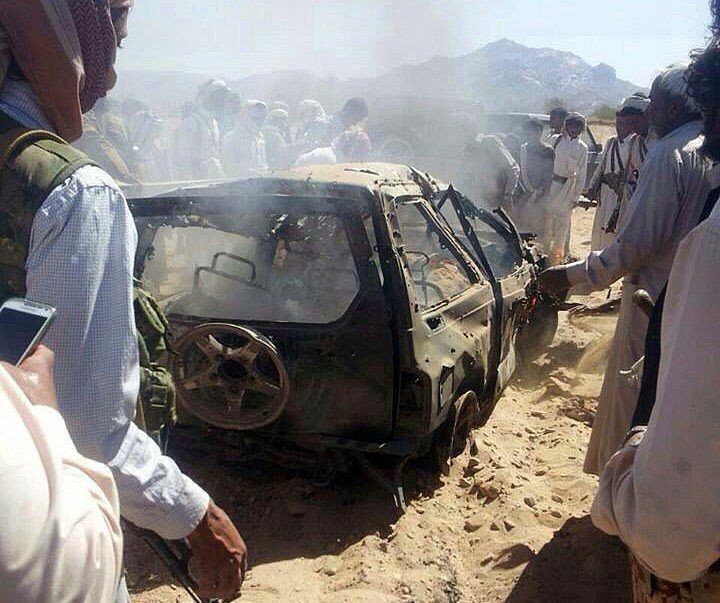 Yemenis gather around a burnt car after it was targeted by a drone strike killing three suspected al-Qaida militants in January 2015. The White House has declassified its procedures for approving operations against terror suspects outside of the United States, providing a window into the decision-making process for authorizing drone strikes and other forms of lethal force. The redacted document, issued by the administration in May 2013, was released in response to a court order resulting from an American Civil Liberties Union lawsuit. "an assessment that no other reasonable alternatives to lethal action exist to effectively address the threat to U.S. persons." First, an agency "nominates" an individual for lethal action, after conferring with lawyers "that the individual would be a lawful target." They prepare a profile of the individual. The agencies that are able to nominate an individual are the State Department, the Treasury, the Defense Department, the Justice Department, the Department of Homeland Security, the CIA, the Joint Chiefs of Staff and the National Counterterrorism Center. National Security Staff, an inter-agency group, convenes a meeting including the agencies listed above to review the proposal. The "nomination package" is then submitted to the "Deputies Committee," comprised of the seconds-in-command at the agencies making up the National Security Council. They decide whether to recommend the strike to the head of the agency that "nominated" the individual for a strike. They look at issues like whether the strike could "interfere with any intelligence collection," or whether the threat posed by the individual "can be minimized by a response short of legal action." The deputies then submit the final positions of the head of each of their agencies after "consideration and discussion." The head of the agency that "nominated" the potential target can authorize lethal action if 1) the other agency leaders unanimously agree and 2) the agency head has sent a message to the President and has received word that the President saw the message. The President himself must approve if 1) "the proposed individual is a U.S. person, or 2) "there is a lack of consensus among [agency heads] regarding the nomination," but the head of the nominating agency still supports it. As the ACLU put it, questions remain about where this guidance applies exactly, "whether the president has waived its requirements in particular instances, and how the [document]'s relatively stringent standards can be reconciled with the accounts of eye witnesses, journalists, and human rights researches who have documented large numbers of bystander casualties." The document allows for less stringent operating procedures during moments of "fleeting opportunity," and "extraordinary cases," including situations where an individual "poses a continuing, imminent threat to another country's persons." As The Two-Way reported last month, the White House has released its own figures on the casualty toll of 473 airstrikes outside areas of active hostilities between Jan. 20, 2009 and Dec. 31, 2015. Combatants: between 2,372 and 2,581 deaths. Non-combatants: between 64 and 116 deaths. These figures do not include casualties in Afghanistan, Iraq and Syria. The report from the office of the Director of National Intelligence acknowledges that reporting from some monitoring organizations "generally estimates significantly higher figures for non-combatant deaths than is indicated by U.S. government information." The document released Saturday also outlines guidance on capturing terror suspects, saying that the preferred option is to place them in custody in a third country. If that is not feasible, "the preferred long-term disposition option for suspects captured or otherwise taken into custody by the United States will be prosecution in a civilian court or, where available, a military commission." It adds: "In no event will additional detainees be brought to the detention facilities at the Guantanamo Bay Naval Base." According to The New York Times, current and former officials had sketched out the process — but "now, with some redactions, the guidance itself has been made public, confirming those accounts and filling in gaps."